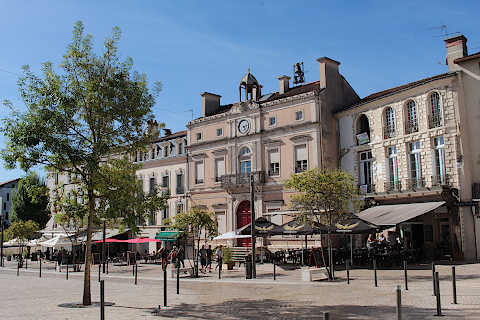 The town of Mont-de-Marsan is the capital of the Landes department of Aquitaine, and south of the Parc Naturel Regional des Landes de Gascogne. It is at the confluence of the Midou river and Douze river (which together form the Midouze river). France This Way comment: although it is not well known as a tourist destination - most visitors to the Landes department are travelling west to the forests and the Atlantic beaches - Mont-de-Marsan is a pleasant town to visit with a picturesque area along the rivers and several monuments and parks to visit and is a pleasant place to stop if you are nearby. 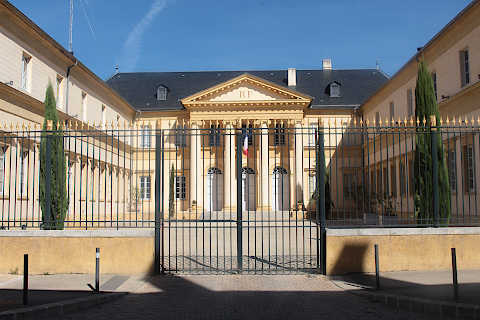 Start your visit at the Mont-de-Marsan tourist office at the end of the Pont G Halimi bridge. Before you go inside you can see the view along the river as well as an impressive statue of a diver suspended over the canyon below. The tourist office have a map with a route to follow as you explore the town which is very useful because you will certainly miss some of the monuments and parks without it! From here, take the path along the south side of the Midouze river. From just below the washhouse you have a lovely view across the confluence of the two rivers, the scene that is used in most marketing material for the town. 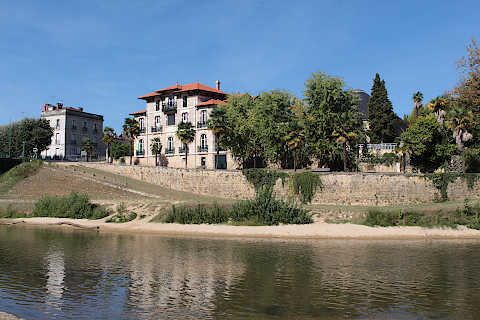 The buildings and small waterfalls are very pretty, and on the other side of the river you can see two imposing villas: the Villa Mirasol and the Vignotte Rotunda. 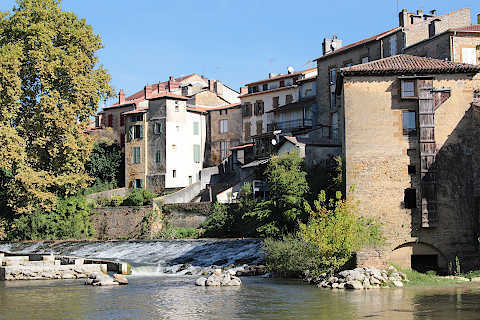 You can follow the promenade along the river for a few hundred metres, then return and follow the paths and roads behind the washhouse (Rue H Thiebaud and Rue de la Gourotte) to reach a narrow street called the Rue des Arceaux. 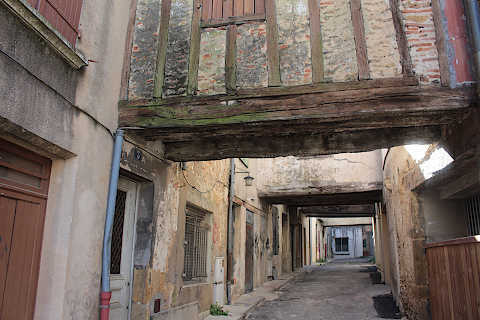 You certainly would not find this street if you were not looking for it, and it is rther a neglected street when you find it, but it has a very unusual feature: there are five medieval passageways that connect the upper floors of the houses on opposite sides of the streets. 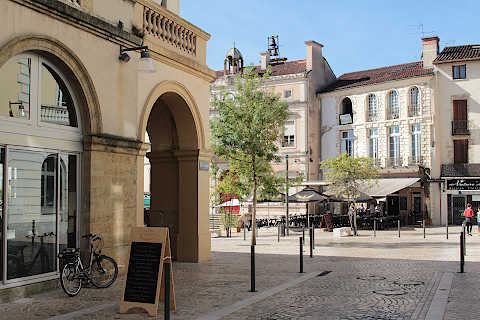 From here you quickly reach the large square in the centre of Mont-de-Marsan, with a fountain and several grand 19th century buildings. 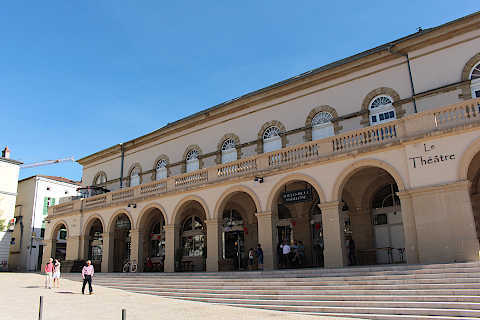 Walk to the other end of the square and then cross the river on the Passerelle des Musees. 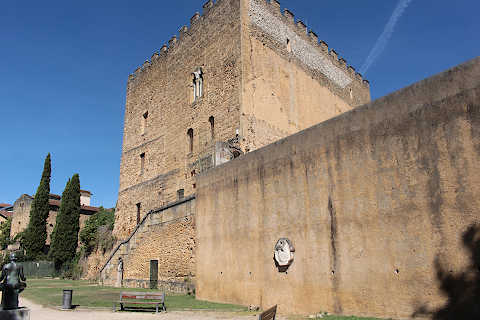 This takes you to the part of the town with the most ancient monuments, parts of the town ramparts, the museum and a park. There are lots of statues here as well, so it is an interesting part of the town to visit. The Museum Despiau-Wlerick of sculpture dates from the 1930's. 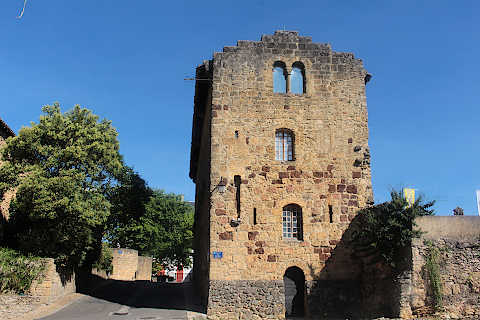 The museum building, the Donjon Lacataye, is an attractive tower that dates from the 13th century: the two houses that originally formed the building were merged and the crenellations added in the 15th century. Despiau and Wlerick were sculptors between the two world wars and the museum is dedicated to their works, as well as other sculptures from the same period. 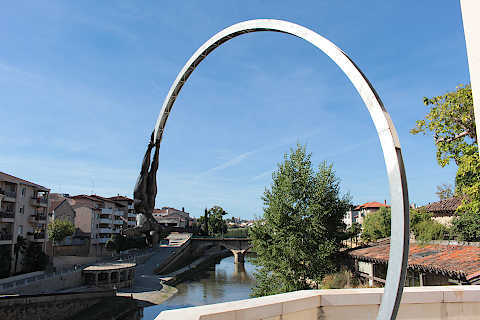 The sculpture theme continues in the town itself, with various examples by the same artists on display as you explore the pedestrianised centre of Mont-de-Marsan. 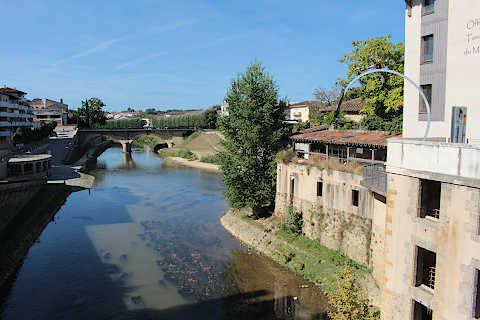 Take a stroll along the promenade a short distance upstream next to the river Midouze, then return and follow the Rue Victor Hugo from here to return to the west side of the centre: there are several grand townhouses along this road. 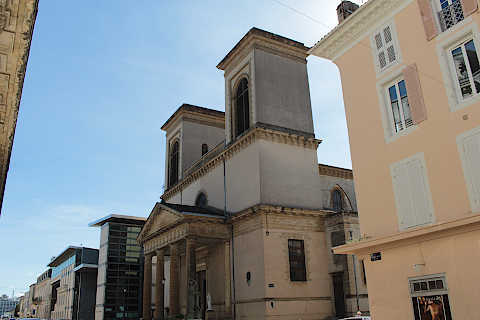 Beyond the Church of Saint-Madeleine (built in 1822) you reach the lively centre of Mont-de-Marsan in the Place Charles de Gaulle, with a theatre and several restaurants, the original town hall for Mont-de-Marsan and a 19th century market hall that was built on the location of a 12th century castle. 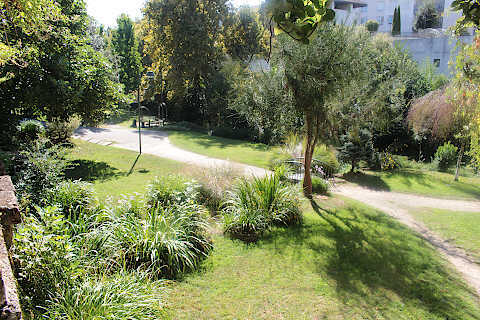 Parc Jean Rameau is a large park to the north of the centre (across the Douze river by the Pont du Lycee) with an extensive plant collection and a lovely place for a picnic. 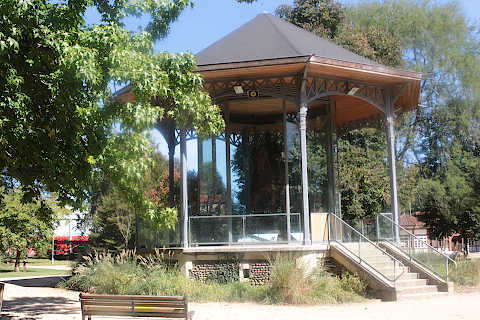 In the centre of the park there is a large bandstand containing a very large statue of Maréchal Foch. 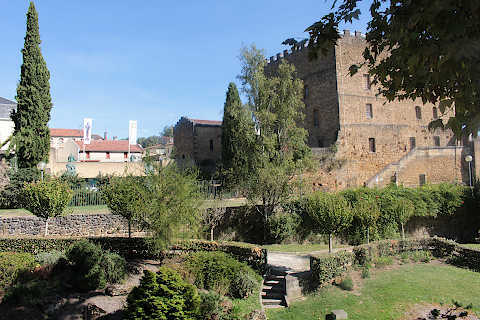 Children will enjoy the animal park in the Parc de Nahuques to the east of the town centre, where they can see animals such as sheep, llamas, goats and emus while garden enthusists will perhaps prefer. 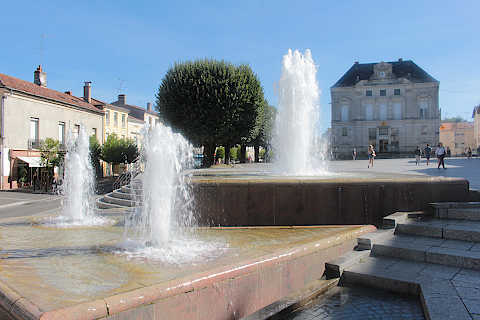 These are just two of the parks in Mont-de-Marsan and help explain how it was awarded the prestigious 4* town in bloom award. 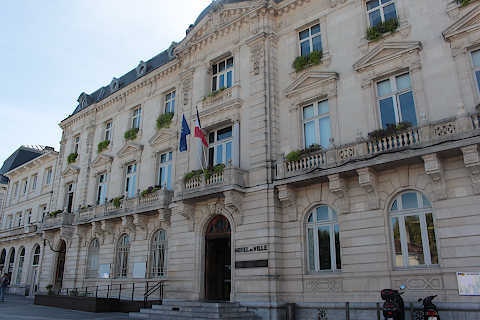 Mont-de-Marsan is also an important base for the French air-force. The most visited attraction near Mont-de-Marsan is at the town of Saint-Sever, about 15 kilometres south of here where you can see a very impressive example of roman style architecture and stone carvings at the 11th century Abbey Church of Saint-Sever. Dax is to the south-west of here and Nérac is to the north-east.